Basir Ahang, 27 –year-old, is an independent young journalist who was directly involved in the release of Gabriele Torsello, the Italian journalist of La Repubblica, who was kidnapped by Taliban in Helmand province. Mr. Basir was working on Torsello release under the supervision of Renato Caprile, antother La Journalist. At one point Basir achieved confidential reports by contacting the Taliban authorities who detained Gabriele Torsello. He, thus, got to know the names of the kidnappers. Basir kept receiving calls from the kidnappers which would inform him about the health status of Torsello. Basir never discovered how Gabriele Torsello was released. However, after the release Basir started receiving unknown phone calls and finally left the country. After a short period he got back to Kabul. He started working with a local channel Radio "Farda" and at the same time he was working as freelance journalist with the weekly "Namah" and the La Repubblica. 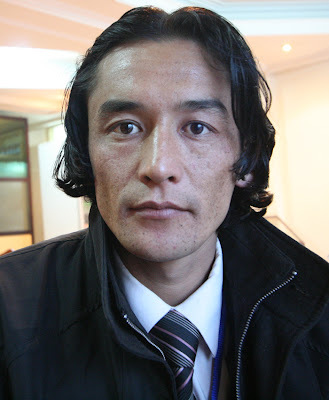 Basir Ahang was also a prominent student of Kabul University, but he was harassed and intimidated by Taliban during his work with La Repubblica, while he was working hard to communicate and find information about Torsello's abduction. Any information about him has stop to flow since a month, none knows where is he. On behalf of Afghan Association Blog Writers I express my concern about his safety. On October 27 Parwez Kambakhsh, 23 year-old, was arrested and put in jail for downloading from the Internet and distributing to friends an article about the Prophet Mohammed. 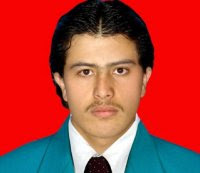 Similarly, today a local court in Mazar-e Sharif, north of Afghanistan, passed a death sentence for alleged blasphemy against Sayed Parwiz Kambakh, a young journalist. The trial was held behind closed doors, without a lawyer to defende Mr. Kambakh. In a already published short report it was reported that Parwiz Kambakhsh commented that there were one prosecutor and three judges, they passed the judgment by default and never let him reply. Today, the Ministry of Information and Culture has claimed with a press release that Parwiz Kambakh was not a journalist and his case is not related to the media. Afghan Association Blog Writer is deeply disappointed of hearing this from the Ministry of Information and Culture. It is a clear cover up of the reality of the issue. Kambakhsh was arrested because he had taken an article from the web. The article illustrated some parts of the Quran that talks about women's rights . Mr. Kambakhsh had only downloaded it, but not written it himself. Afghan Association Blog Writer (Afghan Penlog) is deeply concerned about the trial that was carried without any respect for law whatsoever. Freedom of speech, granted by institutional law, was disregarded as well. The Afghan Association Blog Writers (Afghan Penlog) supports and protests against the detention of Kambakhsh and demands to the Afghan Government an immediate release of Parwiz Kambakhsh. New Year started with a bang! I got my firs trip outside Afghanistan for over 2 years, this was very much needed after the hectic 2007 that I had. The trip to India was perfect and I mean it! I visited new places I had never seen before, met new people I had never met before, made some friends, refreshed my mind and had a blast. I am not writing this to discuss my trip to India but all the troubles at Kabul airport. To start with trouble No.1: there are so many security checks (targeting Afghans off course, the expats cars go all the way to the plane) that you wished you had not taken the plunge to travel. First I was checked a kilometre from the airport: Do you have a passport? Is it genuine (they have the fake ones as well)? Visa? What is the purpose of your trip? Business or pleasure (this is a joke)? And all the other uncomfortable talk. The poor Afghan traveller that is me has not yet passed this check that he is ordered to get out of the car and walk to the terminal building 500 meters away! Imagine that you have 3 bags, roughly 30-45 kg and there is no trolley! As you approach the terminal you see a big line forming in front of the entrance to the terminal. 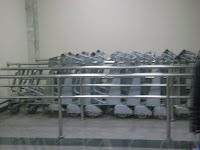 You wonder what this is for and it struck you hard to see that there is another hand operated security check. Open all your bags, what is this? And you say: Oh Zabet Saeb Ain Neekare man ast! (Sir this is my underwear). Weird Neekar comes the reply. It is very embarrassing that your private cloths (and they always see them first!) are exposed in front of + 100 people at a public place, I don't know about others but I freeze when this happens. Anyway, to continue the adventure I passed this hand operated security check, and entered the terminal and right there it struck me like lightning: There is an X ray machine that is there in the airport to check the luggage! Why the hell are they checking me for this long when they have an x ray machine installed at the airport? I didn’t find the answer and departed Kabul airport after gruelling explanations to the immigration officer that I am genuine and not a fake person! I will skip the part in Indian airports because I don't care about their service delivery, they are also cousins with the guys in Kabul airport but they have a genuine reason for that. Unimaginable overcrowding! That is the genuine reason. The Safar back to Kabul was smooth as I wished my trip would be. Then we landed at Kabul airport and it started all over again! I mean the troubles. The chaos in immigration were really embarrassing as there was only one flight that landed. 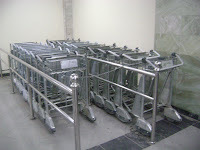 Yes the airport authority of Kabul had chained all the trolleys so that Kam Air passengers would not use them (they are supposedly only for Ariana and I was travelling with Kam Air). This is more than embarrassing, this is shameful and unprofessional and not a competition at all! There was nobody from Kam Air at the arrival lounge and the passengers loaded their heavy bags onto their shoulders and started the long march back home. I wonder when will our persons in charge as they call themselves learn! Learn to respect Afghans as they are Afghans as well, learn the concept of "customer is the king" and finally learn how to compete!